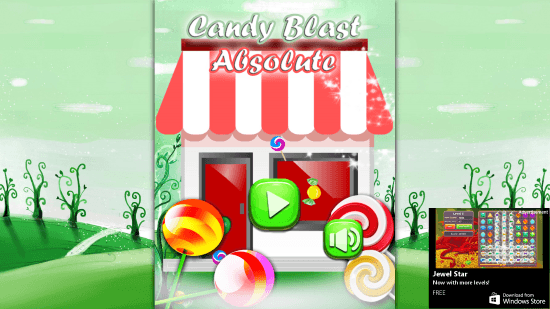 Candy Blast Absolute is another installment of free the puzzle game app, Candy Blast *. This is a puzzle game for Windows 8 and 8.1 PC developed by Dash Games Studio. This puzzle game is almost same as its predecessor, but with a slight different and exciting theme, and new set of candies. Match at least 3 same candies in a row, or column to explode them, and collect points. You can also make different matches for more than 3 candies, in different fashions. Unlike the old game, it has 5 different set of candies in different color and shapes. You get red cherries, blue lollipops, purple lollipops, yellow candies, and green toffees to play with. Match more than three candies to get a special wrapped candy, a cup cake, or an ice cream. When you match 4 candies horizontally, or vertically, you get a Cup cake. Match 5 candies in an intersection of 3 vertical and horizontal candies, to get a Wrapped candy. The best super candy is an Ice cream, which you get when you match 5 candies vertically, or horizontally. The Cup Cake candy blows a whole line of horizontal, or vertical candies. The Wrapped candy blows out every candy around it. The Ice cream candy blows the set of candy available on the screen, to which it is swapped. There are a total of 55 levels in this puzzle game. As you complete the levels, the game play gets tougher. 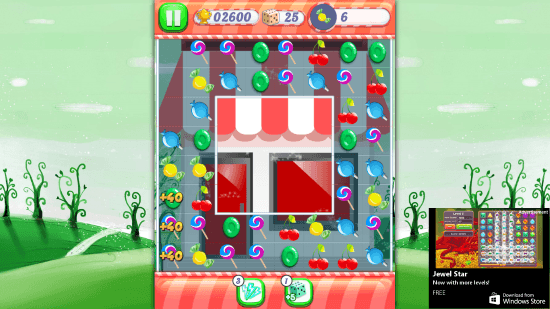 Achieving a target score: You have to match, and blow the candies to reach a target score, and clear the level within limited number of moves. Clearing a dirty area: You have to burst candies in the dirty areas to clear them out. Clear the dirty areas within a limited number of moves. Collecting a specific candy: Burst a specific candy to reach a target number, within limited moves. There are many more levels that you will come across as you proceed with the game. To help you clear the difficult levels, there are various boosters available as well. If you have played Candy Crush Saga, you will definitely love this game. So, what are you waiting for? Go ahead and take the challenge to finish up this puzzle game.